Houndoom in game: 815 Who? Important notice! 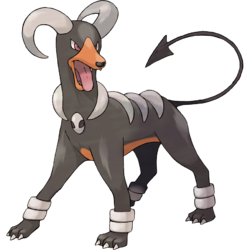 Pokemon Houndoom is a fictional character of humans. 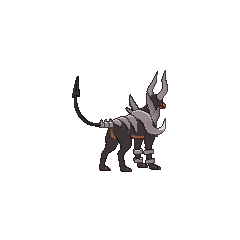 In a Houndoom pack, the one with its horns raked sharply towards the back serves a leadership role. Leadership is determined by fights within the pack. Its gut is full of toxins, which are used to compose fire. This gives Houndoom's fire a foul odor and the wounds it inflicts will never heal. 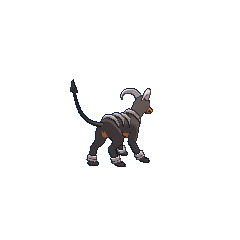 Houndoom appears near rough terrain areas. Its howling induces shivering in other Pokémon, and often sends them scurrying back to their nests. Harrison used a Houndoom during the Silver Conference, where it helped to recover the flame of Ho-Oh and defeated Ash's Snorlax in their battle. However, it lost to Ash's Bayleef and was Harrison's final Pokémon in the Semi-Finals, in which it lost to a Rhyhorn. Houndoom first appeared in Houndoom's Special Delivery. When Misty's Togepi got separated from Ash and his friends, it came across a Houndoom that was delivering a package. Houndoom took Togepi back to Ash, Misty and Brock. A Pokémon poacher was using a Houndoom alongside a Scyther to chase Celebi at the beginning of Celebi: Voice of the Forest. Another Houndoom appeared in Flint Sparks the Fire! and The Fleeing Tower of Sunyshore! under the ownership of the Proprietor. A Houndoom also appeared in Genesect and the Legend Awakened battling the Genesect Army at Pokémon Hills. 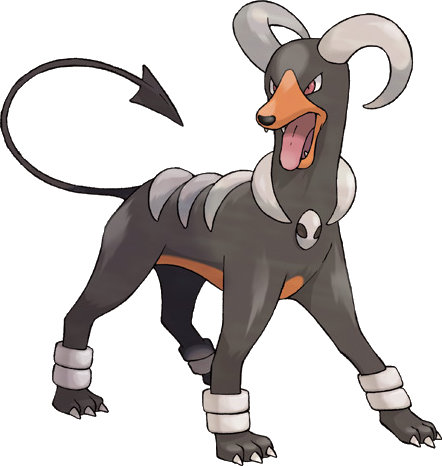 A Houndoom that can Mega Evolve into Mega Houndoom appeared in Mega Evolution Special IV, under the ownership of Malva. A Houndoom appeared in From A to Z! under the ownership of Mable. A Houndoom was used by the ninja's that attacked the Ninja Village in A Festival of Decisions!. A Houndoom that can Mega Evolve appeared in Volcanion and the Mechanical Marvel, under the control of Levi and Cherie's Mega Wave. Several Houndoom appeared in The Right Hero for the Right Job!, under the ownership of Team Flare Grunts. A Houndoom appeared in The Screen Actor's Guilt in Vitzo's fantasy. Two Houndoom were among the Pokémon resting in some hot springs in Entei at Your Own Risk. In A Ruin with a View, they were used by Team Magma in Oldale Town. They reappeared in a flashback in A Three Team Scheme!. A Houndoom was used by one of the students of the Pokémon Trainer's School in Gonna Rule The School!. A Houndoom made a cameo appearance in a vizualization in Hi Ho Silver Wind!. A Houndoom appeared in May, We Harley Drew'd Ya!. A Houndoom appeared in a flashback in Duels of the Jungle!. A Houndoom that can Mega Evolve into Mega Houndoom appeared in Mega Evolution Special I. 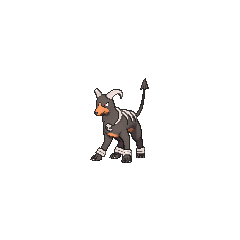 A Houndoom made an appearance in The Lake of Rage, under the ownership of a Team Rocket Grunt. Maxie is revealed to have five Houndoom in his arsenal, one of which he used to kill Norman to prevent him from using Rayquaza to interrupt Kyogre and Groudon's fight again. Two different Trainer-owned Houndoom appeared in HeartGold & SoulSilver chapter. 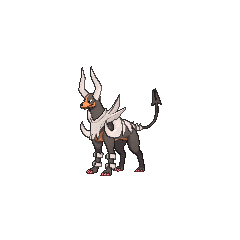 Karen's Houndoom was seen prior to her Elite Four colleagues challenging Gold in the Pokéathlon. Archer's Houndoom appeared in a flashback and was used to threaten Petrel. Team Plasma liberated a Houndoom from an unknown Trainer. It was left behind at N's Castle at the end of the Black & White chapter. In the X & Y chapter Team Flare Scientist Mable owns a Houndoom.